I usually get my ideas in a flash of inspiration. It comes when I least expect it and usually revolves around something I've seen or done recently. This piece came not long after I watched "Adaptation". Though this image has little to do with the movie in general it's got a lot to do with a specific moment. Specifically a passing reference to the literary pitfall, "deus ex machina". "Deus ex machina" literally means "God from the machine". In writing it means that when a writer paints himself into a corner he creates a convenient solution to get out. 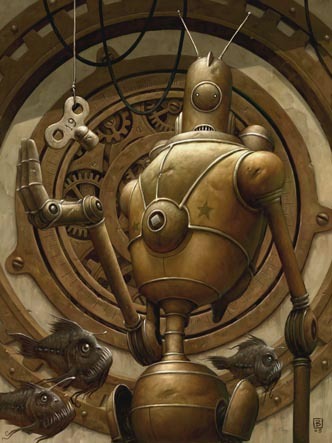 "Piscis Ex Machina" means "fish from the machine". I meant it simply as a play on words as I had included the fish and thought it would be a great tie-in to include them in the title. However, I realized that there was much more going on here. The intentional "deus ex machina" is, of course, the key. It hangs on a wire being delivered from out of frame. Because the robot needs to be wound, the key becomes the classic "deus ex machina". Yet, if you look in the background there's a clockwork device. Originally it was supposed to be a clock and you can still see the demarcations around the outside ring, but, as I finished the image I realized there was no way I could insert the hands without destroying the composition, SO, I left them out. In other words, I used my influence as a creator to conveniently remove myself from a painted corner... In other words, "deus ex machina"! These are the things that make me love art. The accidents that allow me to be surprised by the very art that I supposedly have such control over... And if you're still not convinced, the title was originally going to be "Deus Ex Machina". The fish I put in simply because needed something to fill the bottom of the image.